Back in 2005, CTPA first joined with the US Department of Labor’s Occupational Health and Safety Administration (OSHA) and with the Connecticut Department of Labor Division of Health and Safety (Conn-OSHA) in a formal Alliance. 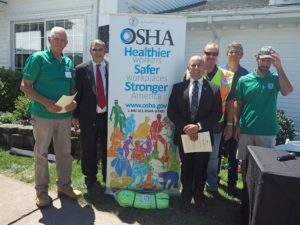 Through this Alliance, these three organizations have dedicated themselves to sharing information and promoting training, for the purpose of increasing safety among those who practice tree care in Connecticut. That initial Alliance was formally signed into being at the 2005 Summer Meeting. At this year’s Summer Meeting, the three organizations came together to renew their shared commitment to safety and safe practices, through an updated Alliance agreement. The original Alliance was an outgrowth of the impassioned work of CTPA’s Safety Committee. When the Safety Committee was first organized, in the early years of the 2000’s, the common understanding was that everyone who works in the tree care industry should have the expectation of arriving home safely at the end of the day. In those early meetings, the CTPA members who made up the Committee recognized the importance of inviting entities such as OSHA and Conn-OSHA into the discussion. This was for a variety of reasons. Partly, there was a desire to demonstrate to the regulators that we as an industry take safety seriously. It was also in part a search for insight, through improved access to and understanding of the information that OSHA collects. This included the statistical details on accidents, which have the potential to show how to avoid similar outcomes in the future. Mostly, the Committee membership was expanded out of a sense of shared mission, as we as a group explored ways to get the key messages out to where they would do the most good. The Alliance was a natural outgrowth of that shared commitment. Members of OSHA and Conn-OSHA, as well people from insurance companies, equipment suppliers, utility line clearance specialists and other tree care companies, both large and small, continue to meet as the Safety Committee, and continue to come up with new ways to promote safe practices and increase safety awareness within the industry (see, for instance, the post on the Spanish EHAP course). CTPA members (and others) who are interested in participating in the work of the Safety Committee are encouraged to contact Emmett Shutts, Committee Chair, or Cathy Dvorsky, CTPA Executive Secretary.